Today I have projects to share using the newly released Taylored Expressions products. There are plenty of new products – stamp sets, dies, embossing folders, pattern papers and sequins released and are available for purchase from Taylored Expressions store. 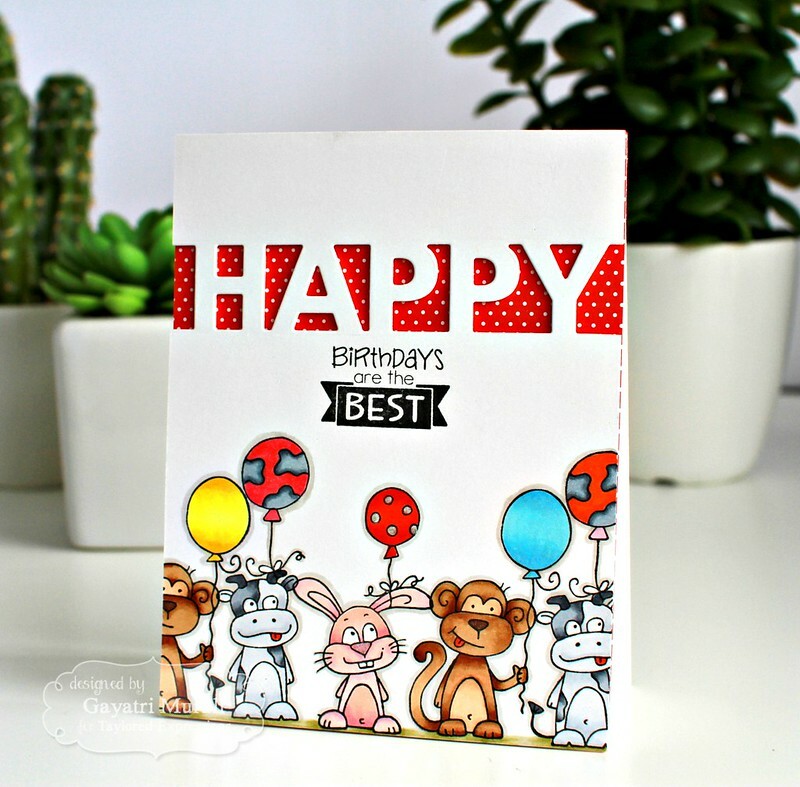 I have a couple of cards using the new Balloon Buddies stamp set and dies. How cute is this set? Love that they have coordinating dies as well. This set is one of my favourite set from the release. Here is my first card using Balloon Buddies stamp set and Block Party: Happy die. I started my card with die cutting the “HAPPY” using Block Party Happy die on a white cardstock panel. Then I stamped the the images from Balloon Buddies stamp set at the bottom of the panel using masking technique. Coloured them using copic markers. I stamped the sentiment from the stamp set just below the die cut. To highlight the die cut sentiment, I adhered the red polka dot pattern paper from Rainbow Bright 6×6 pattern paper collection to the card front. Then adhered the stamped and die cut panel to the card front using foam adhesives. I love the cheeky expressions on the bunny, monkeys and cows. 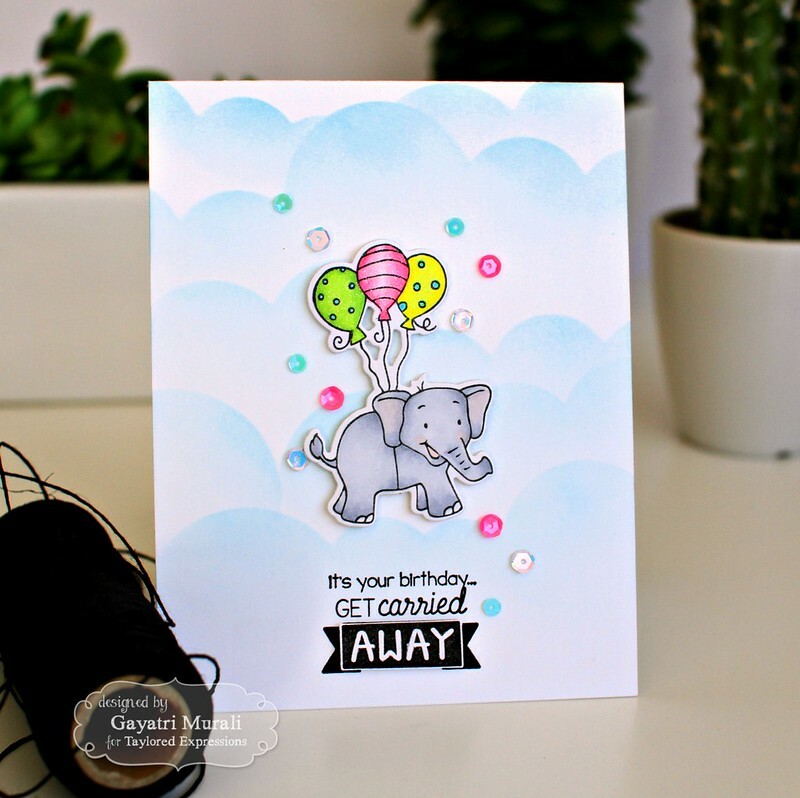 Here is a second card using Balloon Buddies stamp set and dies. There are more awesome inspirations from designers at Taylored Expressions Gallery. Check them out. Thanks for stopping by my blog today. Such cute cards!! The elephant is very cute! !